Last year I wrote about my search for Rock Springs Cemetery, the burial place for my great grandfather John Wesley Taliaferro, his brother Bob Toliver, and Alex Poole another relative whose relationship remains undetermined. I am still trying to confirm the exact location of the cemetery. I thought if I found others who were buried at the cemetery their records might give some clue to the location. I did find other burials, but all that’s stated on these death certificates is the name “Rock Springs” – no exact location. In my November 2009 post I promised to find and honor others buried in Rock Springs Cemetery, specifically those who lived in the same communities as my ancestors. I have searched through hundreds of Georgia death certificates available online in the Georgia Virtual Vault. So far I have found 15 persons, including my ancestors, whose death certificate indicates the burial place was Rock Springs Cemetery. Not a very large number, but I am proud. I wish I could identify with certainty their burial place. 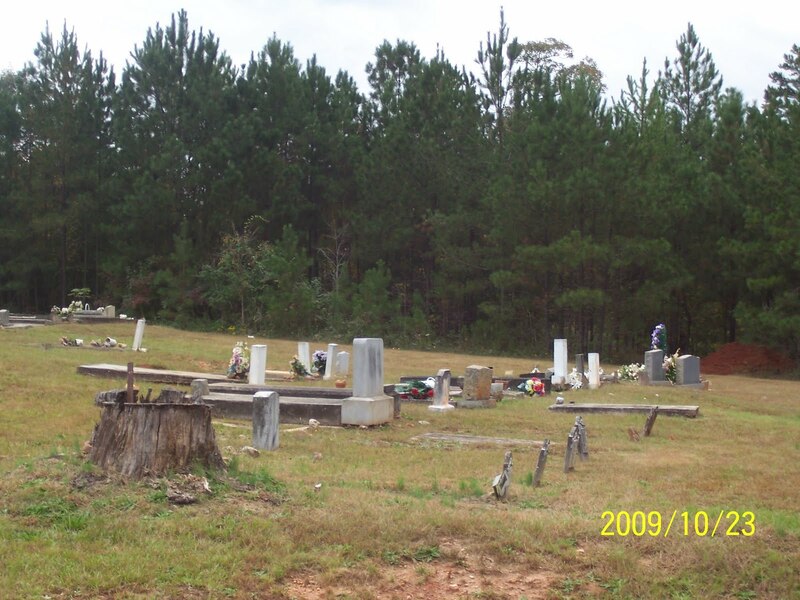 Maybe it is the Rock Springs Cemetery in Henry County, McDonough, GA that was the subject of my November 2009 post. It seems the most likely candidate. Yet, none of these names appear on any of the headstones. There is no finality. Maybe their remains are covered by the soil, weeds, and grass of the many unmarked graves. Maybe they lay beneath the graves marked only with a crude rock or stone. 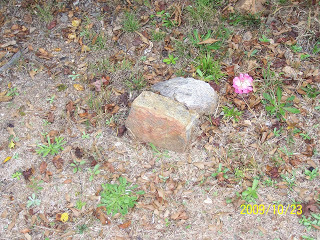 I picked this photo because of the little pink and white flower to the right of the stones that just happened to be there the day of my visit. 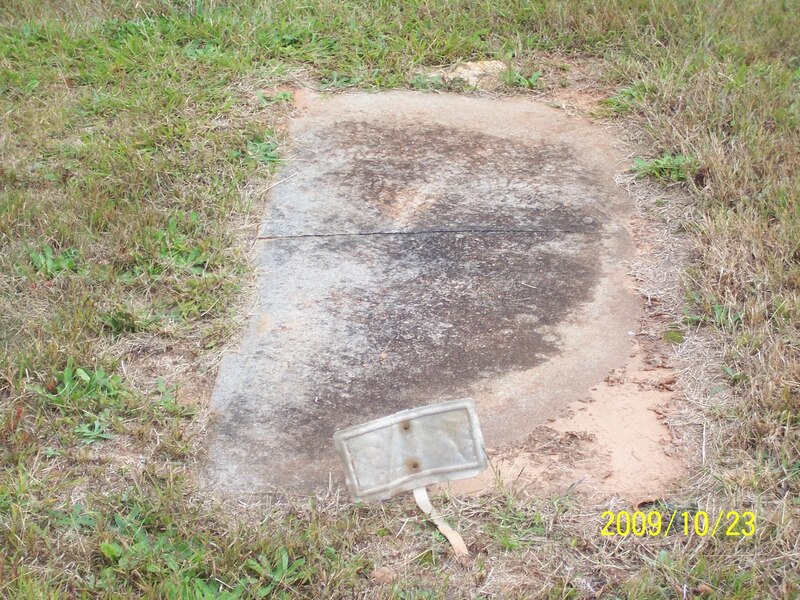 Maybe it was a sign that someone was buried there…Maybe he was…Maybe she could be…Maybe they are… Maybe….Maybe… Maybe…. Maybe someone will happen upon this post and reclaim their long lost ancestor. THIS IS MY PRAYER. 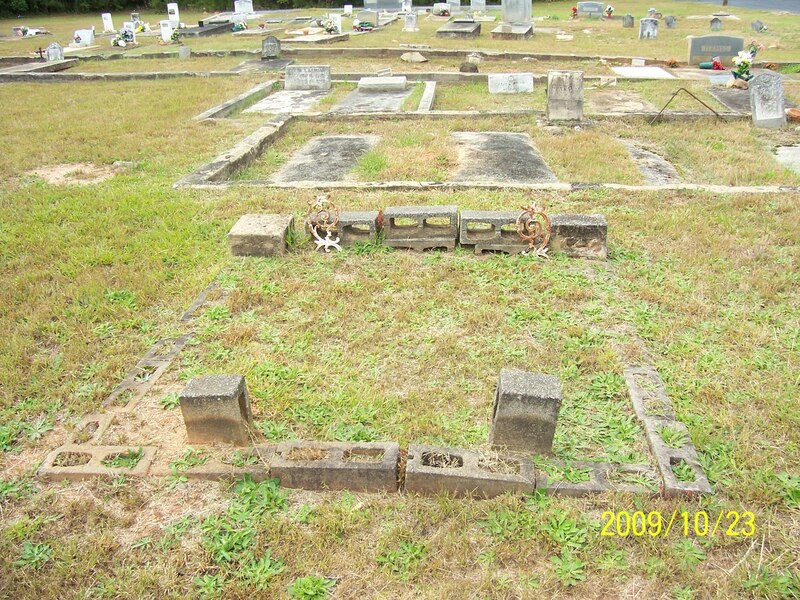 These are photos of the cemetery at Rock Springs Baptist Church located in McDonough, Henry Co., GA. This is an active African American Church and Cemetery. Sadly, there are numerous graves marked only with stones, others with unreadable funeral home markers and, of course, many with no markers at all. My search for the burial place of my great grandfather, John Wesley Taliaferro, has become somewhat of an obsession. I have this nagging feeling that just will not go away; I know that cemetery is out there somewhere just waiting for me to find it. My ancestors’ Taliaferro slave owners and their collateral families lived and owned land in the McDonough, Henry Co., GA area along Jonesboro Road. Some of my ancestors were born in Henry Co., and many lived on Jonesboro Road, so this cemetery was a real possibility for the burial place of my ancestors. Unfortunately, the transcription for this cemetery did not contain the names of any of my ancestors. Other than the cemetery transcription, I have not found any records on the church or cemetery. A trip to the Georgia Archives did not produce any additional information. I am searching for something to connect my Taliaferro ancestors to this church/cemetery. 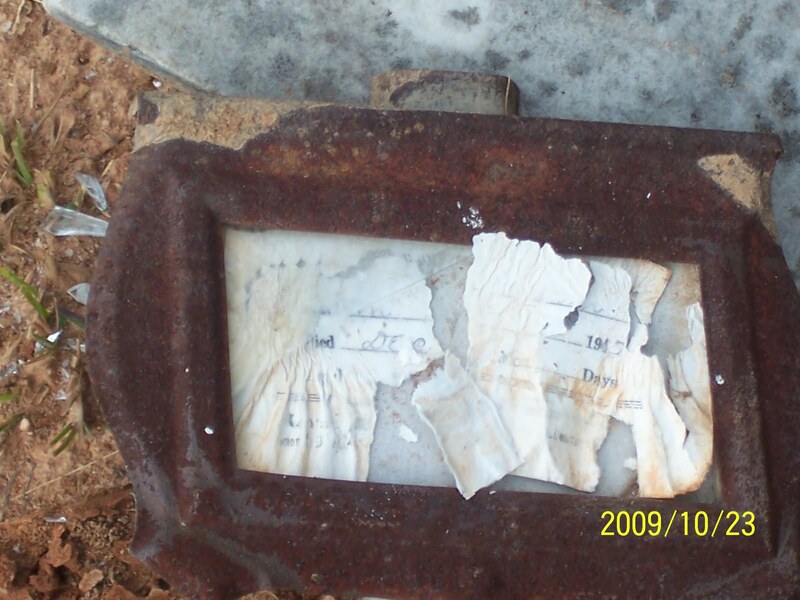 In September 2009, I posted Tombstone Tuesday – Rock Springs Cemetery…Not. My brother Bernard and I thought we had found “the” Rock Springs Cemetery, but we were wrong. According to their death certificates, John Wesley, his brother Bob Toliver (aka Robert Taliaferro), and another relative Alex Poole (exact relationship undetermined) were buried at Rock Springs Cemetery. Recently, I discovered that several of their neighbors were also buried there; they are Ison Wilson, Robert Wilson and William Wilson. I’m not sure if my Taliaferros are related to these Wilsons, but you know I’m checking into that as well. So far I have found six people who are buried at Rock Springs Cemetery, including my ancestors. Unintentionally, I think I have made finding this cemetery, and honoring all those who are buried there, one of my research goals. It just doesn’t seem right that these six people, and probably many others are buried in this cemetery and no one knows (or cares) where it is, or who they are. I hope to find out. Wish me luck in my quest.